You're welcome! Experience a life changing encounter with Jesus Christ! We are very thankful for your visit, and we pray that you will be blessed by the Lord. Here you will find information concerning our church and its ministries. We hope you find your time spent here a blessing. 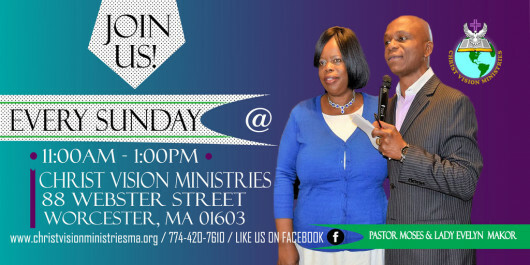 Our church is a warm, loving and diversed congregation, here in the city of Worcester, Massachusetts. We want you to feel comfortable and at liberty to call on us for prayer and spiritual needs. Please feel free to browse through the various areas of our website and learn about our dynamic, vibrant and fast growing church. Our First Lady's welcomes everyone and makes your stay, a home away from home. A well-structured team of leaders, with a mision to make the vision of the church stronger for the next generation. YOU ARE WELCOME. WE LOVE YOU! Miracle Center of Faith Missionary Baptist Church-Maryland.